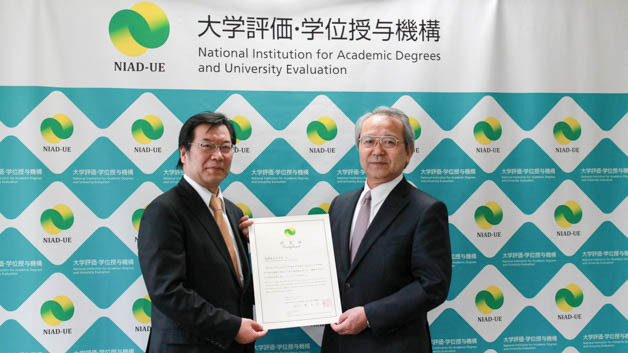 On 24 April 2015, a ceremony was held at UNU-IAS to mark the accreditation of the institute by the National Institution for Academic Degrees and University Evaluation (NIAD-UE), an accreditation and evaluation organization certified by the Ministry of Education, Culture, Sports, Science and Technology of Japan, after a year-long application procedure. Mr. Kazuo Okamoto (Vice-President, NIAD-UE) and Mr. Akihito Kawaguchi (Specially Appointed Professor, NIAD-UE) offered their congratulations to UNU-IAS, represented by Prof. Kazuhiko Takeuchi (Senior Vice-Rector, UNU) and Dr. Kazuhiko Takemoto (Director, UNU-IAS). 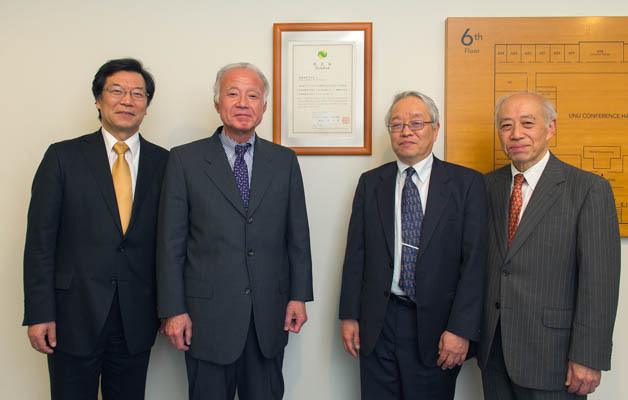 The accreditation had been awarded on 26 March 2015, and the certificate initially presented to Dr. Takemoto by Mr. Tomoyuki Nogami (President, NIAD-UE) on 30 March 2015 at the NIAD-UE office in Tokyo. The accreditation process, based on the accrediting organization’s 10 standards, evaluated UNU-IAS on its postgraduate programmes, research, institutional management, and building and facilities. Only academic institutions that meet all standards receive accreditation. This is the first time that the Japanese organization has evaluated and awarded an international organization. The accreditation is retroactive, applying to the UNU-IAS master’s and doctoral degrees as well as the past master’s degree programme offered since 2010.